Break the summer salad routine with this cold soba dish! When it’s hot outside, cooking seems like a sweaty chore, and if you’re anything like me, opting for a quick, no-fuss, chilled dish is ideal. 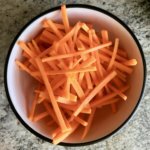 Most of the time this is a salad, but salads get tiresome after eating them every day for a few weeks. 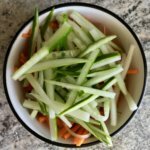 So, here’s a traditional hot weather Japanese dish that’s easy to make and will help to break up the old summer salad routine. 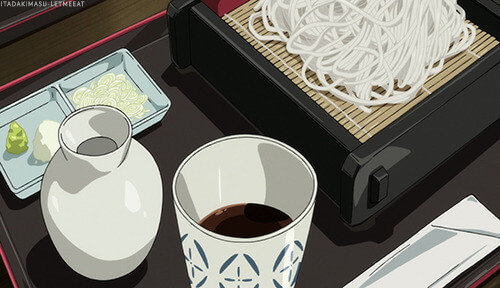 Zaru soba (ざるそば) is chilled soba noodles served with a cold dipping sauce called mentsuyu. 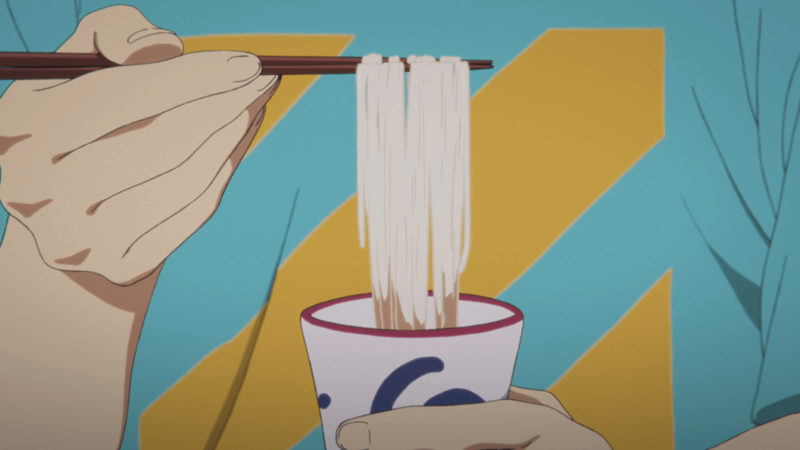 According to Japanese Cooking 101, zaru soba is traditionally served on a slotted bamboo mat to allow the water to drip off the noodles, making reference to its name, “zaru,” which translates directly as strainer. “Soba” (そば) refers to buckwheat in Japanese. Thus, soba noodles are long thin noodles made of buckwheat flour and water. Buckwheat, despite its implication, is not wheat and contains no gluten. 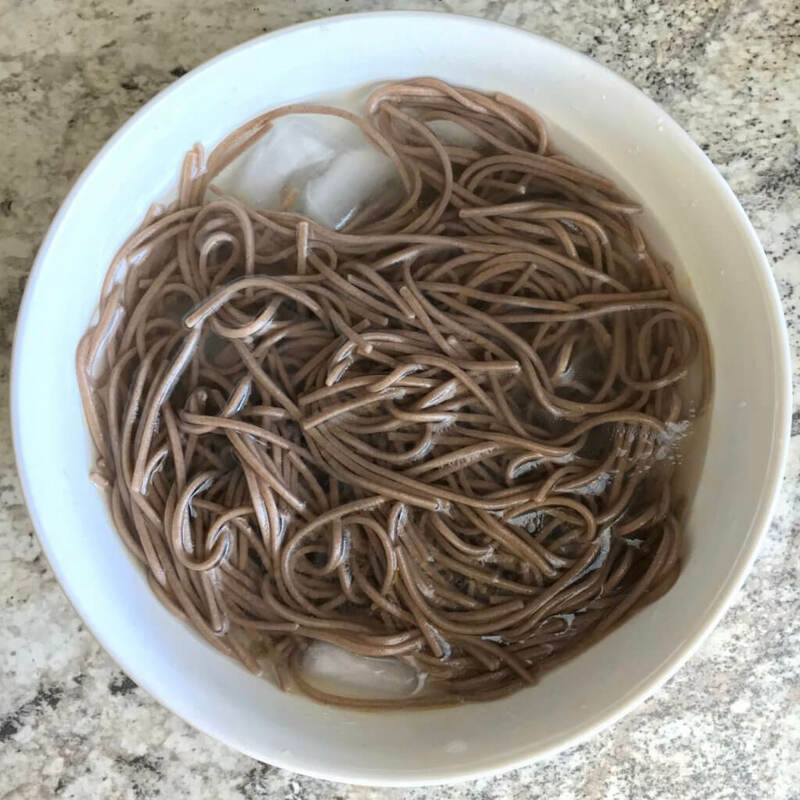 However, American grocery stores seem to carry more varieties of soba noodles with a combination of buckwheat and wheat flour than just simply buckwheat. So, when choosing your soba noodles, be sure to look for 100% buckwheat soba if you want a gluten-free dish, also called juwari soba. Mentsuyu (麺つゆ), or simply tsuyu, is an all-purpose sauce and broth with mouth-watering umami flavor. 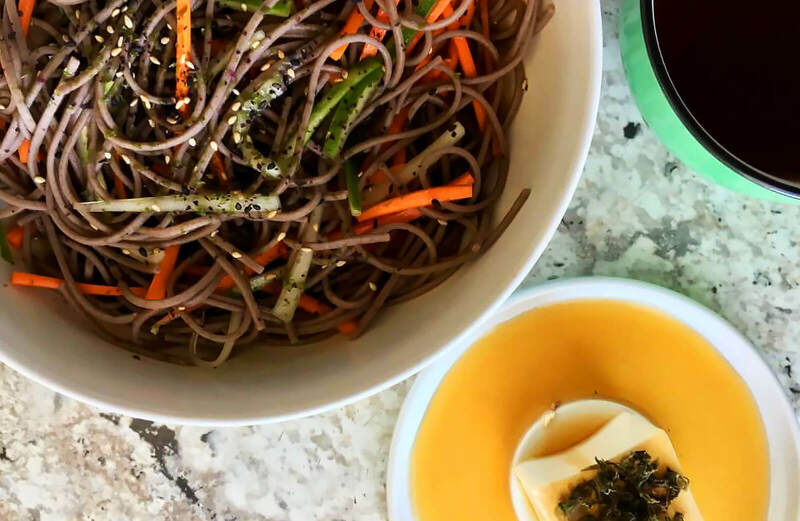 In this recipe, tsuyu is more concentrated and used as a chilled dipping sauce for the soba noodles, bringing out the complex, nutty flavor of the buckwheat soba. When it is used for dipping, tsuyu is referred to as tsuketsuyu, or literally “dipping soup.” Since this recipe makes so much sauce, you’ll definitely end up with leftovers. Luckily, tsuyu can also be watered down and used as a well-seasoned soup broth, called kaketsuyu. Plus, it stores in the refrigerator for 2-3 weeks. Traditionally, tsuyu is made from kaeshi, a Japanese term referring to a mixture of soy sauce, mirin, and sugar, flavored with katsuobushi (dried bonito flakes). In this recipe, katsuoboshi has been replaced with a fish-free mixture of dulse granules and toasted nori, which are both algae that imbue a fishy, sea water type taste. Hiyayakko (冷奴) is cold silken tofu seasoned with soy sauce or ponzu sauce and various toppings like green onions, nori, ginger, and plum paste. 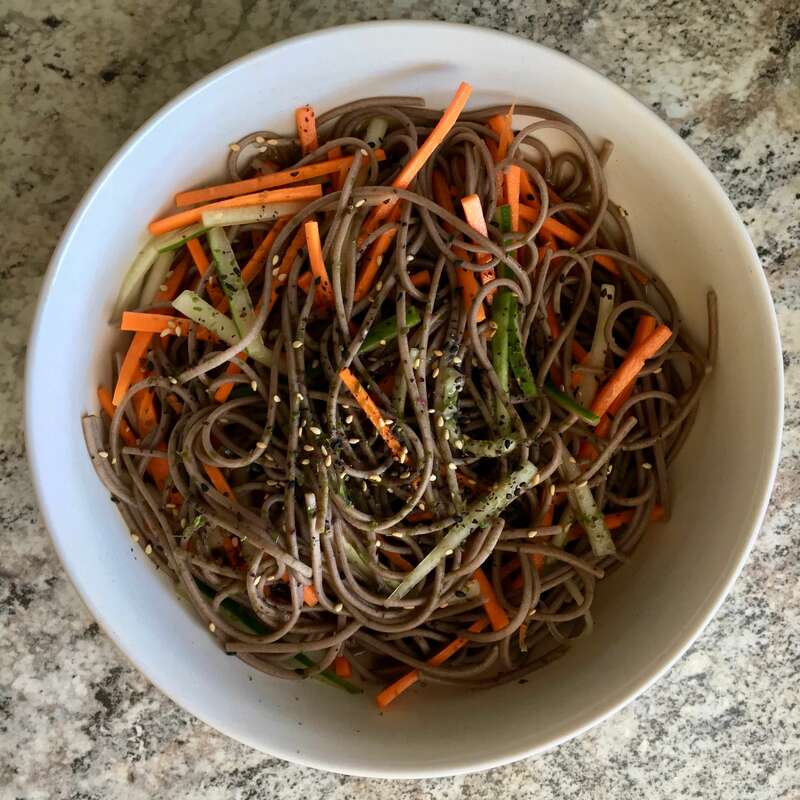 It’s the perfect delicate side dish for zaru soba, and adds some extra protein to round out this hot weather meal without weighing you down. If you’re not really into tofu, other great side options are soft-boiled or scrambled eggs, raw tuna, or even imitation crab. Honestly, though, zaru soba and sencha tsuyu are flavorful enough to eat on their own. 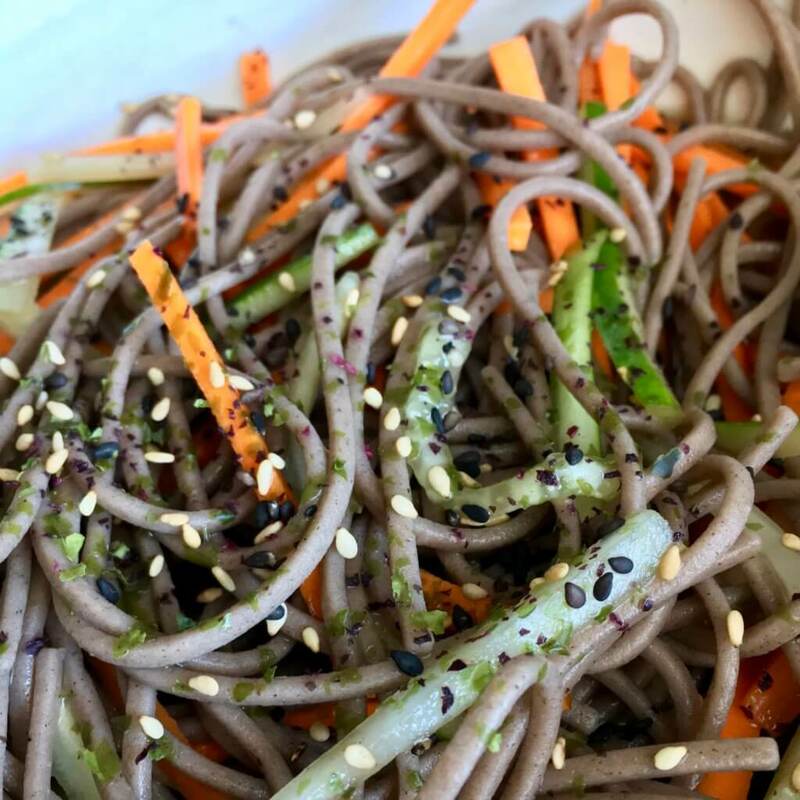 The vegan and gluten-free recipe I am sharing with you is an adaptation of Rosa’s Yummy Yums’ Cold Soba Noodle Salad and Pups With Chopsticks’ Zaru Soba + Genmaicha Sauce. Using a 2 qt. saucepan, bring 3 cups of water to a boil. Once boiling, remove from heat, add Sencha tea bags or tea basket, and steep for 15 minutes. Remove the tea leaves from the liquid and discard. 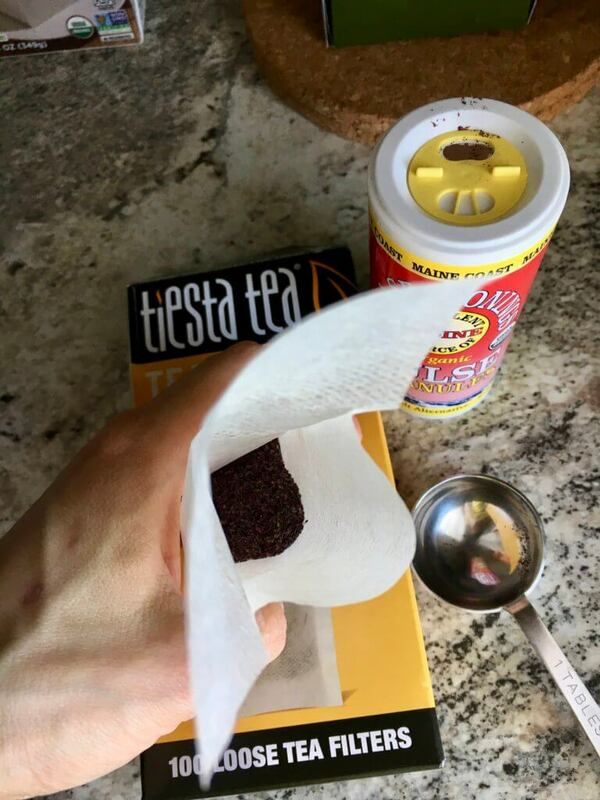 Using tea bags, a tea basket, or a tea ball is the easiest way to ensure the tea leaves are removed from the water once steeping has completed. Add the dulse and nori to a tea bag or tea basket. Then submerge the bag/basket in the tea, and allow to infuse for 15 minutes. Remove and discard once the infusion is complete. Pour the tamari, mirin, and sake into the saucepan and stir. Either transfer to a pitcher or appropriately sized glass container, or set the saucepan with a lid directly into the refrigerator, and chill for 1 hour. Add water to a large pot and set on medium heat until boiling. Refrain from adding salt to boiled water because the dipping sauce is already quite salty. Follow the cooking instructions on your package of soba. For reference, I added the soba to the boiling water and allowed it to cook for 4 minutes. Once the soba is cooked, run it under cold water and rinse off the starch. It will feel kind of slimy at first, but once the starch is rinsed away, it’ll feel more like spaghetti noodles. Prepare an ice bath and add up to 1/4 tsp. of sesame oil. Submerge the soba in the ice bath and oil mixture and let it sit for a few minutes. The addition of sesame oil is optional, but it adds an extra nutty flavor to the noodles. Remove the soba from the ice bath, transfer it to a bowl, and stir in matchstick carrots and cucumbers. Separate the soba into individual serving dishes, and garnish with sesame seeds or furikake. Cut the chilled silken tofu into 4-8 cubes, depending on how big you prefer your servings. Place them on individual serving dishes and pour about 2 Tbsp. of the sencha tsuyu on top of each cube. 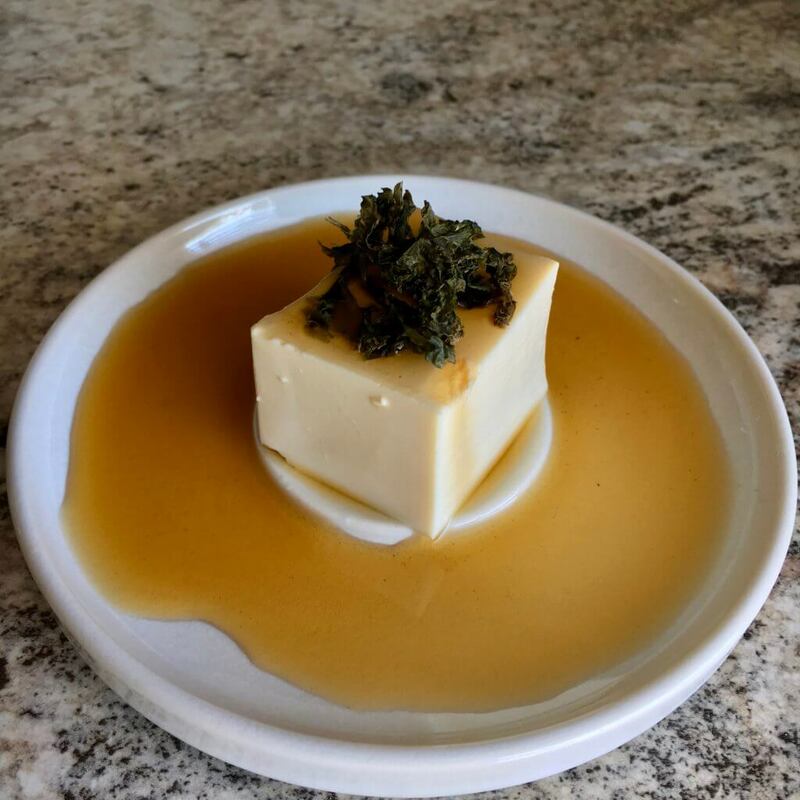 You may also go the more traditional route and drizzle the tofu with tamari and rice vinegar instead of the flavorful sencha tsuyu. Garnish with toasted nori or sliced green onions. To serve, pour some of the sencha tsuyu into individual bowls for each person and place the bowls alongside the zaru soba. Hiyayakko should be served on separate plates or bowls, as a side dish. To eat, use chopsticks to dip the zaru soba into the bowl of sencha tsuyu and enjoy! There will most likely be some hiyayakko and sencha tsuyu left over. Store the hiyayakko in the fridge in airtight containers for 3-4 days and the sencha tsuyu for 2-3 weeks. Add some extra water to the sauce to make a soup broth or just serve with more freshly cooked and chilled soba. *For an entirely gluten free meal, please make sure your soba noodles are 100% buckwheat, also known as “juwari soba.” Buckwheat, despite having the word “wheat” in the name, is free of wheat and gluten. Most soba noodles I found at the store were a mixture of spring wheat and buckwheat. References: COLD SOBA NOODLE SALAD – A LESSON IN ZEN. (n.d.), Zaru Soba (Cold Soba Noodles) ざるそば • Just One Cookbook, Japanese Chilled Tofu (Hiyayakko Recipe) 冷奴 • Just One Cookbook, Zaru Soba Recipe, Zaru Soba (Cold Soba Noodles) Genmaicha Sauce.